Which devices did this bug appear on and is it reproducible on any devices and/or computers? On my iPhone X (iOS 12 beta 10), as well as my iPad Pro 9.7" (with the same iOS version). 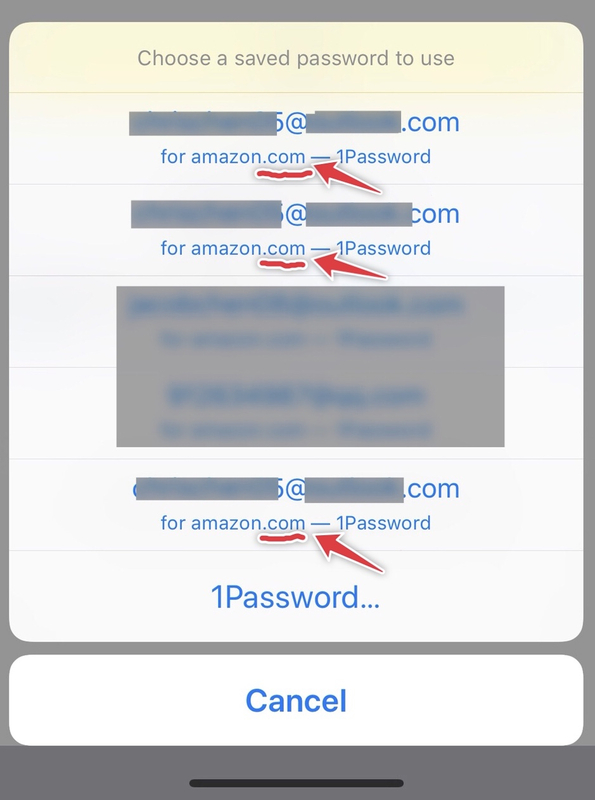 Domains mistakenly displayed in multiple selection menu of 1Password AutoFill function, as marked up in the screenshot below. a. I have 3 Amazon accounts on amazon.com, amazon.cn and amazon.co.jp saved in 1Password. Their usernames are the same but the passwords are not, as you may see in the screenshot below. b. Open iOS Settings app, go to Passwords & Accounts - AutoFill Passwords, make sure AutoFill Passwords is enabled, and tick only 1Password below. 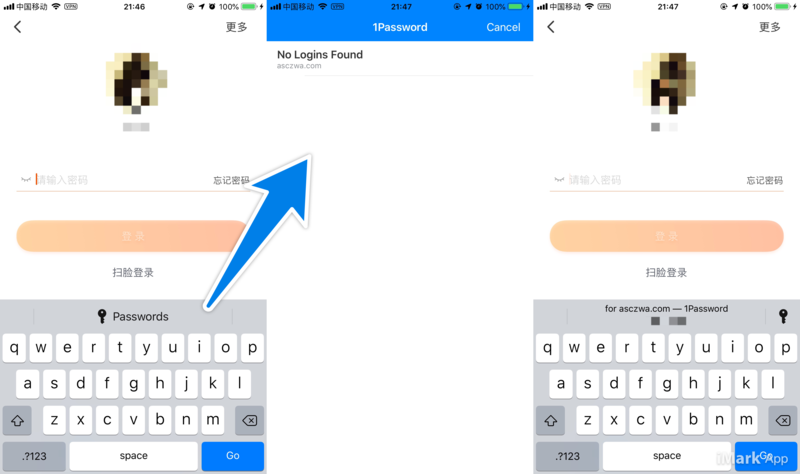 c. Open Amazon app, try to login using 1Password AutoFill by tapping the Passwords above the keyboard. d. There will be a multiple selection menu saying Choose a saved password to use with several amazon passwords to choose. As you can see in the screenshot below, all the domains are showed as amazon.com mistakenly, because two of them should be amazon.cn and amazon.co.jp. Build 70200003 does not show show the list of my passwords when there is no matching domain for a login of an application. I wonder if this is a feature or a bug..
Added the domain for a pre-existing login. At this time that is an expected behavior. @ChrisCHEN05 In testing this myself it appears that iOS is matching your amazon.cn and amazon.co.jp Login items with amazon.com. Respectfully, I’m seeing this bug as well and it’s a terrible user experience. These are domains with distinct login credentials and the saved password UI is incorrectly conflating them, meaning that I’m forced to guess which is “correct” even though 1Password has the correct domain(s) in its database. I don’t care necessarily that Amazon’s alternate TLDs/ccTLDs are listed, but that I cannot distinguish them in the UI. So the “expected behavior” is wrong. To clarify: are you saying that this is Apple’s bug in the password manager integration? Or that this is 1Password’s implementation which is believed to be acceptable? In the former case, has AgileBits filed a radar on this behavior yet? I’d like to dupe that, if so. In the latter case, I strenuously disagree. This is something we will be digging into. We apply domain transformations (amazon.co.jp -> amazon.com) to ensure that the correct logins will fill correctly using our filling technology. Since AutoFill works a little bit differently, we'll need to adjust which domain transformations we apply when vending logins to the AutoFill system. It looks like an iOS bug, because I experienced same problem using LastPass. @ChrisCHEN05 Thanks for looking into that. We'll stay on top of any AutoFill improvements available in new versions of iOS and ensure that we're doing our best to maximize usability.